One would think that an album titled Stages of Sleep would almost have to be some kind of floating ambient music. Not the case here. 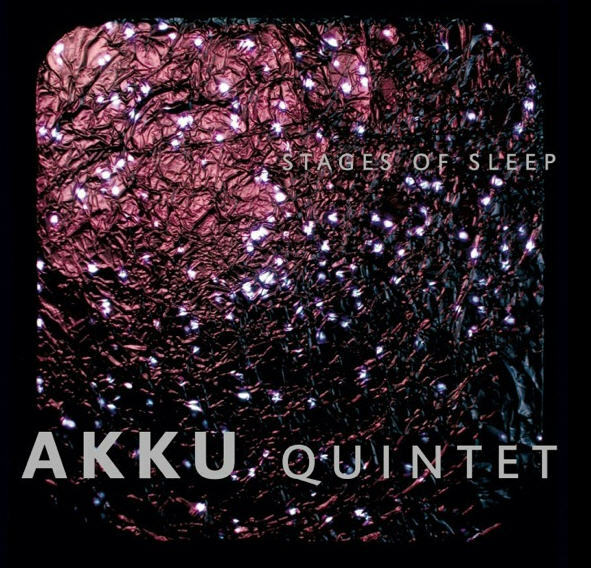 Akku Quintet is a Swiss based jazz ensemble led by Sonar drummer and percussionist Manuel Pasquinelli, who also composes all the group’s material. The approach is gentle, beginning with a “Lullaby” and moving on to several cuts titled “Falling Asleep” and the two part “Light Sleep” where masterful piano and Fender Rhodes passages (played by Maja Nydegger) with explorative saxes and guitars (Thierry Luthy and Markus Ischer respectively) rule the moment as they wander through almost minimalist landscapes of repetitive figures, occasionally raving up into some moments of wild improvisation. The program moves onward though two stages of “Deep Sleep” where odd effects and distortions punctuate repeating melodic patterns, while Pasquinelli’s precise drumming and some musings by electric bassist Jeremiah Keller drive the moment; sax, guitar and Rhodes find a gentle groove to follow through. The “Passing into Deep Sleep 2” is essentially where the bass goes solo and slows the pace down, eventually joined by some gentle guitar and sax explorations in more or less free form melodic territory. The pace picks up again with “Deep Sleep 2” with new guitar and sax figures over the rhythm and a backdrop of shifting organ chords. The gentle transition into “REM Sleep” goes nearly unnoticed, other than the gradual ascendance of shifting meters and trippy groove changes via guitars and sax that signify the onset of dreams, followed by a percussion solo that leads the listener back to the final track “Waking Up.” All of the nine pieces connect together, forming one long seamless continuum. And yes, one can sleep to this, tested by yours truly on a couple occasions, but it’s an excellent vehicle for de-stressing during waking hours also, and a solid good listen any time of day or night.